Kathleen Battle, Francisco Araiza, and Kurt Moll star in this production of one of Mozart's best-loved operas, staged by the Metropolitan Opera of New York with sets designed by David Hockney. In Mozart's witty and whimsical story, the wise but wily Sarastro (Kurt Moll) kidnaps the beautiful but naive Pamina (Kathleen Battle), whose mother is the Queen of the Night (Lucianna Serra). Understandably upset, the Queen commands Prince Tamino (Francisco Araiza) to rescue her daughter, but while Tamino soon falls in love with Pamina, he also comes to believe that the Queen who commands him is the real villain, not Sarastro. 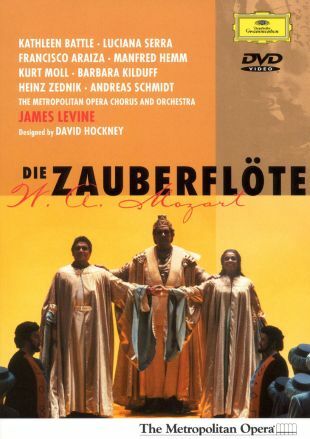 This production of Die Zauberflote is presented in its entirety, including the dialogue sequences that are often excised from recordings of the opera.